Whether she wants to spend her day doing one, two or all three of the activities listed in the photo above is a choice that Wagner Seahawks’ fan @AlliieLo will have to make. The native Long Islander, who is enthusiastically looking forward to another season of football on Grymes Hill, snared four (4) free tickets to HersheyPark last week as part of an on-air giveaway during #NECFB Social Media Day at MetLife Stadium. @AlliieLo was one of thousands of viewers tuned into the one hour, 30-minute program last Thursday and wasn’t shy to show her support of the Seahawks throughout the twitterverse. By properly hashtagging the tweet below, she became eligible for the prize and was randomly selected to receive four adult passes to the Sweetest Place on Earth. 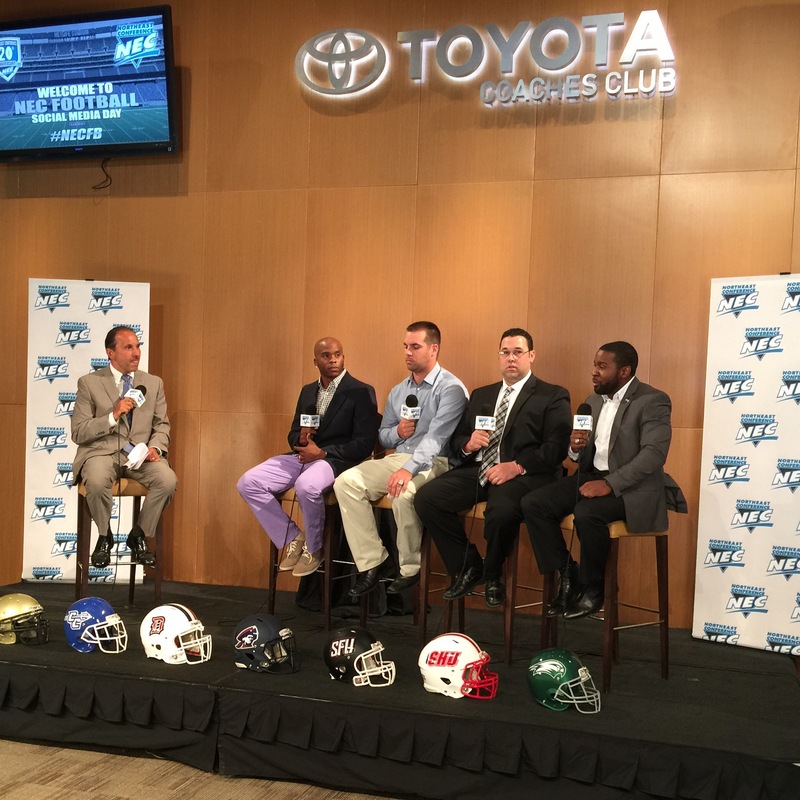 The #NECalumni Roundtable discussion at MetLife Stadium on July 23, 2015. “Celebrating the past while focusing on the future” is a quick way to summarize the #NECFB Social Media Day event that transpired at MetLife Stadium on July 23. It wouldn’t have been as much of a celebration, however, had a distinguished group of alumni failed to attend. Fortunately, Nick Doscher (Wagner), Rashad Barksdale (Albany), Anthony Doria (Saint Francis), Myles Russ (Robert Morris), Gordon Hill (Sacred Heart) and John Tashjian (Bryant) were all present for the festivities at MetLife Stadium. If you’re not sure why any of these men are important, then take a look at some of the biographical information that the Overtime! Blog staff has listed below. Wagner’s Big Al Page, a Preseason All-American, thoroughly enjoyed the steak served in the Toyota Coaches’ Club this afternoon. Accompanying Al in the buffet line as we went up for thirds, the defensive tackle, who is listed at a svelte 295 lbs, said to me, “This steak is legit. I may be 350 by the time I leave here.” Al, I’ve been there before and life at 350 ain’t so bad. Enjoy that steak. Rashad Barksdale on Nick Doscher… “I can’t believe that guy sitting next to me on the panel was a quarterback. He looks like a linebacker.” … For having never seen Doscher play (Barksdale graduated in 2007 when Doscher was still playing ball in the Kansas City Royals farm system), his description was right on because Nick Doscher played quarterback with a linebacker’s mentality and it was fun to watch. I answered numerous questions today as anyone good PR director and host should at an event such as #NECFB Social Media Day, but there was one question in particular that stood out from all the rest. About an hour before the program was to start, the lovely wife of Robert Morris head coach John Banaszak asked me, “What hashtag should I use to tweet about this event?” … You HAVE to love a person who appreciates the art of #hashtagging. Finally, maybe he was supposed to be working, but Michael Caputo was watching. The No. 2 receiver on the NEC’s all-time yardage list was quick to tweet his reaction to a comment Barksdale made during the alumni roundtable. @RB25HUD @NECFootball my man. Thanks for shout out. I had a ball playin against u too. The best brings out the best. Coaches and student-athletes from all seven NEC football programs descended upon MetLIfe Stadium to ceremoniously kick off the 2015 season, the conference’s 20th on the gridiron. #NECalumni, corporate partners and media were also in attendance as the conference celebrated its football history and previewed the season ahead. For the first time since joining the NEC in 2009, Bryant earned the moniker of preseason favorite. The league also unveiled a 27-member Preseason All-NEC Team that includes a quartet of STATS Inc All-Americans – Al Page (Wagner), James Rentz (Sacred Heart), Chris King (Duquesne), Khairi Dickson (Saint Francis). The coaches’ votes have been tallied and will be made public during Thursday’s #NECFB Social Media Day program live on NEC Front Row and ESPN3. In the meantime, we want to hear from YOU, the fans. Vote for your NEC football preseason favorite below. The poll will be open until 11:00 am ET on July 23. At that time, Paul Dottino and John Schmeelk will sign on live from MetLife Stadium as #NECFB Social Media Day coverage kicks off. After they reveal the official preseason poll results and All-NEC Team members, they will throw it to the sideline where Jon Cabral will unveil the results of this Overtime! Blog Fan Poll.